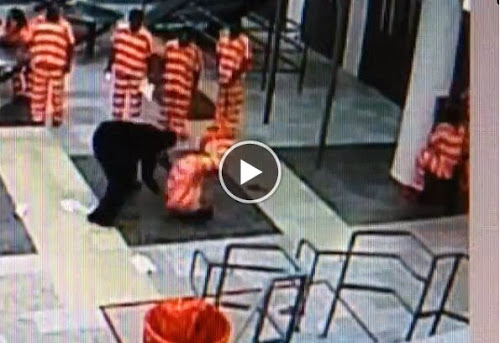 A Wake County detention officer charged with causing an inmate’s death said in court Wednesday he felt the prisoner was a threat and needed to be subdued. Shon Demetrius McClain, 40, died from blunt force trauma to the head and neck 13 days after prosecutors say he got into a fight with Officer Markeith Council. Council, a detention officer at the jail since 2009, is charged with voluntary manslaughter in the case. The defense rested Wednesday, and the jury began deliberation shortly before 4 p.m.
Testifying on his own behalf, Council recalled the night he got into an altercation with McClain. Council said he was the only officer in the cell block with 55 inmates when McClain started arguing with him. Council had been passing out sheets to the inmates when McClain accused him of nearly slamming his hand in the cell door. About 15 or 20 minutes later, Council said, inmates were out of their cells when a combative McClain approached him again. Council said within moments McClain struck him in the jaw, and they began to tussle. The officer tried to handcuff him while keeping an eye on the crowd. Council said he didn’t have time to use pepper spray. He called on all available officers and a nurse, and put the block on lockdown. McClain – who had been in custody since May 28 on misdemeanor charges of possession of drug paraphernalia and consuming malt beverage on public property – was taken to WakeMed, where he remained on life support until his death on June 17. Council, who has three children and a baby on the way, said his career goal is to become a prison warden. His wife is a Raleigh police officer. He said he didn’t know McClain prior to that night and “didn’t have a problem” with him. During testimony Tuesday, other inmates said that McClain – who was 5 feet 7 inches tall and 119 pounds – was helpless once he was pinned by the bigger officer. Jurors were shown security video that showed Council slamming McClain to the ground twice. During his cross-examination Wednesday, Wake County District Attorney Colon Willoughby focused on the physical differences between the men. Council weighs 290 pounds and played football in college. Willoughby asked Council whether he considered subduing McClain by sitting on him, rather than slamming him to the ground. "Why did you throw him down the second time?" the prosecutor asked. "You know that at that point, throwing him down was going to hurt him." Council replied: "I didn't think to hurt him. I was thinking about getting him off of me."